Dental Implants undergo the same wear and tear as natural teeth, and care is needed to keep them looking and feeling great. 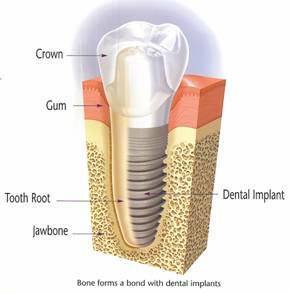 Once a tooth has been lost or extracted, a dental implant is recommended. Dr. Cothern has a wonderful periodontal office that we refer to, to have the implant placed. Then the patient returns to us to have the porcelain crown placed. Our lab fabricates a custom abutment that fits into the implant. A beautiful, natural porcelain crown is tailor-made for your smile. Crowns are made of lithium disilicate (a form of porcelain) which is highly aesthetic and a high strength material. Perfect Impression Laboratory (which is located in Plano) will, on occasion, see a patient to create a custom shade that will ensure a quality crown that matches the rest of your smile. A perfect shade is created to match your eye color, skin color, hair color, and height. This will allow you a perfect shade for your beautiful smile.